Inspiring gifted kids for 25 years – and they sure inspire us! December has been a month of reconnecting with Seabury alumni who have come back to share their stories of life after Seabury. After having been at Seabury for a long time now, it is always exciting to see former students and meet those who were at Seabury before my time. I love to hear the stories of where they have gone and what they have done since leaving our program. Over the years, I have talked with and heard the stories of many of our alums – both recent grads who are still in high school and those who have gone on to colleges and careers. A number of themes have emerged from those conversations, themes that both validate the work that we are doing with our current students and that provide valuable information for parents regarding the benefit of the significant investment they are making in their child's Seabury education. First, every alumnus I have ever talked with or heard from through others has said that their experience at Seabury has had a significant impact on their lives, choices and successes. Alumni consistently tell us that Seabury was the place where they recognized their passion for learning and where they discovered what true academic rigor looked and felt like. Many have shared experiences of going on to high school programs with a reputation for rigor and challenge and finding, instead, that there was a great deal of work and hours of homework, but much less rigor in terms of thought, analysis and application of learning. 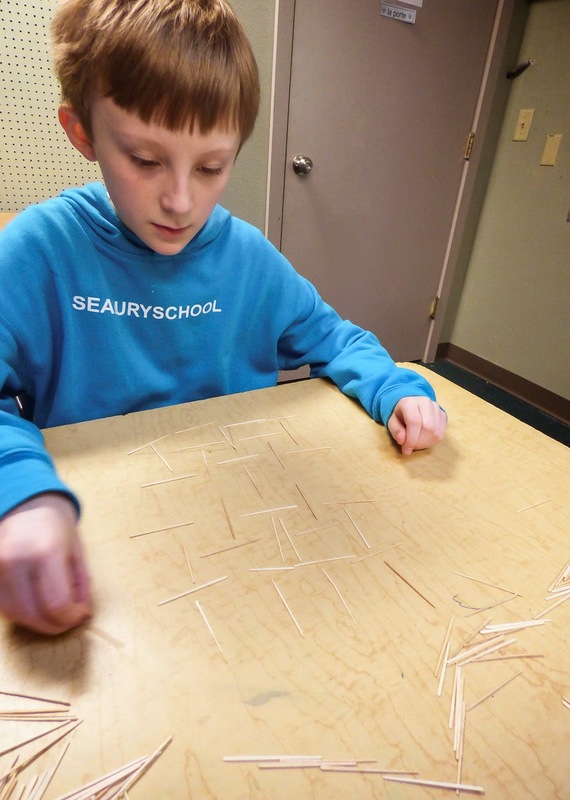 At Seabury, students from pre-k through eighth grade are expected to take information they learn and apply it in new and unique ways – a rigorous activity requiring higher level thinking and deeper understanding. A number of alums have shared that Seabury set the bar for them, and that they demanded that kind of rigor from the teachers and professors they had in high school and college. Second, alums consistently tell us that Seabury is the place where they gained self-confidence. Research tells us that when gifted students learn with other gifted students, they not only increase their academic achievement, but also show greater social/emotional growth than when they are in classes with more typically developing students. We see that every day at Seabury – our students inspire and stimulate deeper levels of questioning and discovery in each other. And they grow in confidence as they recognize that they not only have areas of strength and expertise, but that others have areas of strength as well and that they can learn from and support each other. We see that self–confidence carrying forward with students as they move into high school, college and career. We see alums demanding excellence from themselves and seeking out those who support and encourage them. Third, our recent grads talk about Seabury's program giving them the tools to advocate for themselves, getting what they need from school and other experiences. When we talk with graduates of our current middle school program, we hear again and again that the community element of the program – our students’ experiences interacting with people of all ages through partnerships, field studies as close as Tacoma and as far off as the D-Day beaches at Normandy, participation in the Model UN – even Thursday lunches out – has given them confidence, poise and sophistication beyond their years. They are able to advocate for themselves appropriately in their high schools, asking for more challenging classes, talking with teachers, seeking out internships and relevant experiences, and getting what they need to be successful. 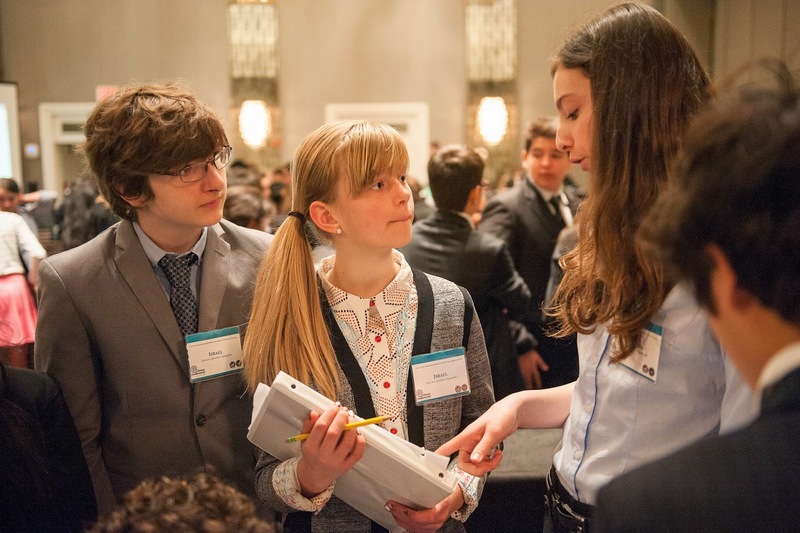 Whether they are at public or private schools, they tell us they have learned how to be their own advocates and they attribute that to their experience at Seabury. Finally, we our alumni show us that Seabury is not a school that produces "cookie cutter" students who look the same and follow similar paths after leaving our school. At Seabury, our goal is to help students discover their passions and develop their talents, whatever those might be. When we look at our alums, we see young people who are pursuing careers in medicine, business, social service, law and academia. We have musicians, dancers, and artists. We have alumni who have studied at Ivy League schools and students who have military careers. We have a successful Indie musician, an Olympic athlete in training, technology experts, a rocket scientist, world travelers, and students who have made their way from high school to college early. The broad range of schools our students attend and careers they have chosen reflects Seabury's commitment to helping our students define success for themselves and to giving them the tools to ask great questions, think deeply and seek inspiration and innovation. Whether they started at Seabury in pre-k and finished the eighth grade here, or spent just a remarkable year or two with us, our alumni are an inspiration. Seeing them discover their passions, set their personal bars high and seek excellence in a variety of ways reminds me of the tremendous importance of our work. It is significant to me that Seabury is the only school I have worked at in more than 30 years in education where students cry on the last day of school because they don't want the school year to be over. Seabury students past and present inspire us and inspire each other. We are grateful for all of them, and I am humbled when I see what they are contributing to the world. It is a privilege to be part of this special school! What does it mean to be “gifted?” We are often uncomfortable with that word and unsure what it means. Parents of young children who come to visit Seabury often tell me that they are not sure their child is really “gifted” but they can see that their child is developing differently – more quickly in many areas – than other children of the same age and they are concerned about what that will mean when it’s time for school. They’ve read the list of characteristics of giftedness and recognize their child in many of them, but what does that really mean for schooling, for parenting and for life? On Wednesday after our annual Seabury Thanksgiving feast was over and everyone had gone home, I was locking up the lower school building when I saw a family wander into the parking lot. I walked over and introduced myself. As it turned out, it was a Seabury alum, out for a walk with his mom and a friend. He attended Seabury from kindergarten through eighth grade and was eager to share his memories and tell me about what he is up to now. He is working as a French chef, building on an interest in the culture that was sparked in Mme. Olliphant’s French class. We talked about classmates who have become video game creators, who design high tech security systems, who have make successful phone apps, and one who is an indie rock star. He said that Seabury was the place where he and his friends felt safe being who they were, pursuing their interests, learning at a rate that was appropriate for them, and developing the confidence that would allow him and others to pursue their passions as they moved beyond Seabury. This week, we will be hosting several of our more recent graduates who are currently in high school. Again, as we look at our graduates, we see them finding success in art schools, technical and science schools, AP and IB programs, and sometimes creating their own paths through Running Start and other forms of early entrance to college. 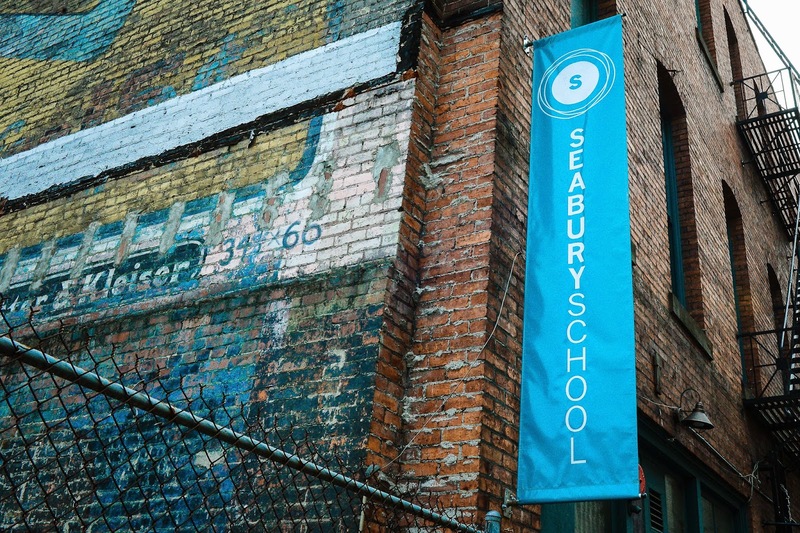 We hear them tell us that Seabury supported their love of learning, encouraged them to seek out those who challenged and supported them, and gave them the confidence to pursue the things they loved doing. They tell us often that at Seabury they found what learning looks like, and they seek that for themselves. When people ask me to describe gifted children, I often say that the biggest thing they have in common is that they are all so unique. Our students come to us with a wide range of gifts. Some are incredible readers who develop insights that are deep and highly perceptive. Others love numbers and patterns, and shine best when they can model an idea in three dimensions or through a mathematical function or equation. Some are incredibly creative, constantly asking, “Why can’t we do it this way?” whenever they are given a task – always seeing new ways to put ideas or objects together. At Seabury, we are committed to helping these highly aware, highly sensitive, highly perceptive students develop their passions. We are not a school that is out to produce cookie cutter students – each one looking the same as all the others. We are a school that is designed to support students as they discover their unique gifts and talents. We give them opportunities throughout their education to connect with adults who are passionate about what they do, so they can recognize that passion when they experience it for themselves. We are a school where kids are engaged, inspired, encouraged to ask great questions and explore possibilities. We are a school that teaches to students’ strengths, whatever they might be, and uses those strengths to address areas for growth. Our eighth graders are spending the school year working on capstone projects that combine their individual passions, the middle school focus on service and Seabury's continued commitment to exploration and discovery. One student with a passion for geography is working with teachers to design a curriculum that he'll try out on our lower school students. Another eighth grader, who is a gifted ukelele player and songwriter, will create an extended play recording. A third is working to learn Adobe Illustrator and Photoshop so that he can offer graphic design services. An eighth grade girl, interested in medicine, will shadow a doctor at a local hospital. Another girl, a talented artist, is submitting a mural proposal to the city. At the lower school, we see passions emerge early. There's a fifth grader who has checked out a thick book called The Elements and a fat field guide on North American birds several times a year since he was in second grade. In fact, that bird field guide is one of the most popular books in the library. 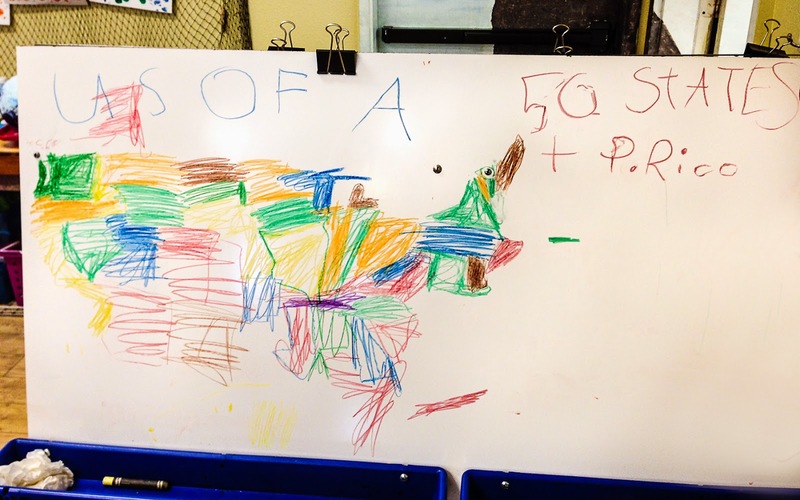 We have a kindergarten student who holds geography as one of his passions. In pre-k as the class was brainstorming words that started with the letter B, he offered "Belarus." He also could draw an accurate map of the United States on a white board from memory. Last year's kindergarten class became passionate about writing and publishing books. One boy started his own book blog, which he still contributes to as a first grader. If you know me, then you’ve probably heard me quote theologian Frederick Buechner’s definition of vocation. “Vocation is the place where our deep gladness meets the world's deep need.” Our goal at Seabury is to provide our students with skills and experiences that will help them discover where their “deep gladness” is – whether it’s in scientific discovery or the creation of art or music or serving others. It is to encourage our students’ ingenuity so that they can continue to reinvent themselves in a world of every changing technology and opportunities. It is the reason that our alums can be found in such a wide range of vocations, having attended everything from Ivy League schools to apprenticeships and trade programs. They are creating new ideas, technologies and works of art that are making our world a better place. It’s a privilege to be in the position I’m in. I get to see our students, from our youngest entrepreneursdeveloping a pretend latte/pumpkin stand in the pre-k room to our alums who are attorneys, chefs, artists, writers and rocket scientists finding what it is they truly love and developing the skills and abilities they will need to pursue those interests. It’s one of the things I am most thankful for! I wish you had the opportunity I have to spend time in Seabury's classrooms. To witness the "aha!" moments. To hear the endless questions. To see students engaged in discussions and debates that are often mind blowing. Seabury's kids love learning. We are thrilled that they often tell us they love school and they have fun every day. And how many schools have kids crying on the last day of school because they don't want the learning to end? It is important to understand that students’ happiness is not our ultimate goal as educators at Seabury. It is, instead, a by-product of a program built specifically for the gifted learners we serve. Seabury's program is different from typical public or private school programs because our kids think and learn differently. There has been a great deal of research over the years into how gifted students learn and develop, and there are agreed upon best practices for making sure gifted students have the same opportunities to be challenged intellectually and supported socially and emotionally as typically developing students. Dr. Karen Rogers, one of the foremost researchers in the field has been doing meta-analyses of various program practices for gifted learners for more than 30 years, looking at the gains students make when each practice is implemented, such as subject or grade level acceleration, grouping students with intellectual peers, and giving students the chance to pursue areas of interest. Where many schools implement or partially implement some of these recommendations, Seabury's program has been developed around these research-based best practices. A student who is ready for math that is three grade levels ahead can work at that level rather than being limited to an "advanced" program that only allows students to work one or two grade levels ahead. A student who is an early reader but who is still young can read with other young early readers who share similar interests and attention spans rather than either being under challenged in a grade level class that is too easy or moved ahead with students who are older and at a different developmental level. Teachers are trained in working with gifted students rather than relying on the myths and stereotypes that often lead well-meaning but untrained educators to make poor educational decisions for children like ours. During Seabury's 25th anniversary year, we are going back to basics – talking about why we do what we do for the gifted students we serve. We know we are on the right track. Not only because the research tells us we are and the experts we bring in each year to speak to parents congratulate us on our work. We know we are doing the right thing because our kids are happy. They love learning. They continue to have millions of questions. They want to know more. And sometimes they even cry on the last day of school. 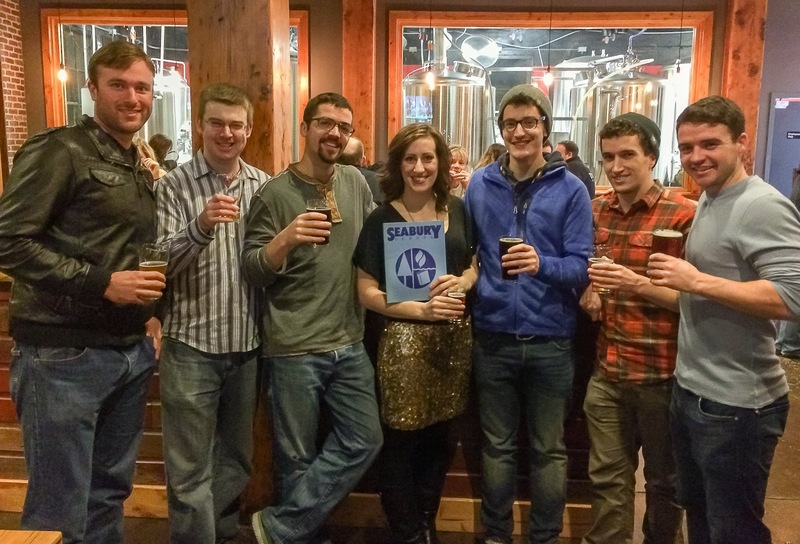 A celebration of math? Really?! For many of us, math was something we did in school, or that we engage in when we balance our checkbooks. It is a necessary skill – a tool we need to manage our lives and do our work. But it is rarely celebrated – except at Seabury! At Seabury, math is more than a collection of skills we tick off a list – it is a way of thinking that can be challenging, fun, engaging, and intriguing all at the same time. Seabury’s teachers seek to develop strong math skills in their students, and also to develop students’ mathematical thinking and love for discovering new patterns and possibilities. Most schools talk about differentiating instruction to meet student needs. Looking at Seabury’s math program you will see that Seabury takes differentiation to a level that is unheard of for most schools. In our effort to challenge each and every student every day, teachers have developed strategies for tailoring math instruction to individual student needs through the use of individualized instruction, flexible grouping, using a variety of teaching tools (rather than just the math texts), and the use of open-ended activities that allow students to go as deeply into a topic as their interest and readiness will take them. Here is a math problem for you. There are 25 students at the middle school. Students are grouped by math ability and readiness, and teachers have used six different texts (ranging from sixth grade, through pre-algebra, algebra and geometry) with students this year. Our middle school math teachers are currently preparing students for final exams that will be given during the last week of school. 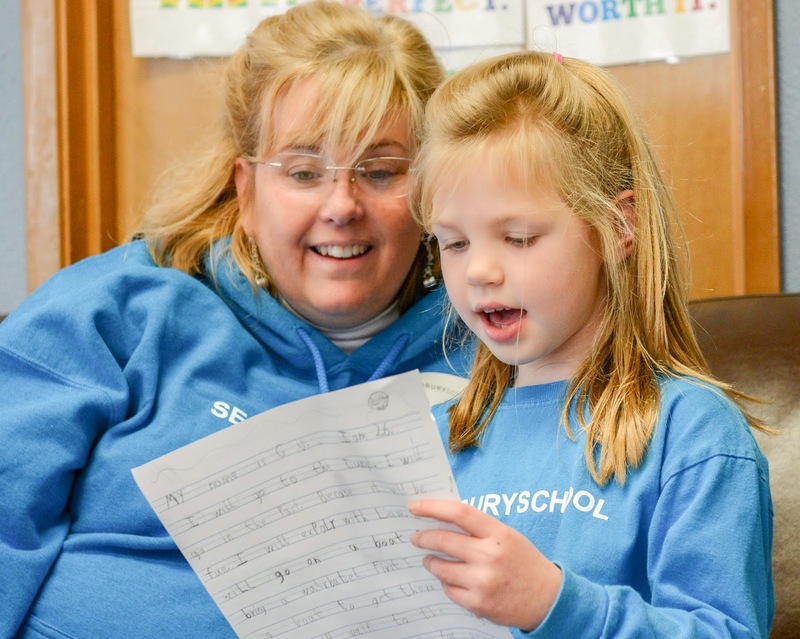 In order for each student to take a final that is tailored to what she or he has studied this year, teachers are How personalized does that make Seabury’s math program? preparing a total of nine different finals, each with its own final review worksheet. But math isn’t just working in a small group or individually with a teacher at Seabury. 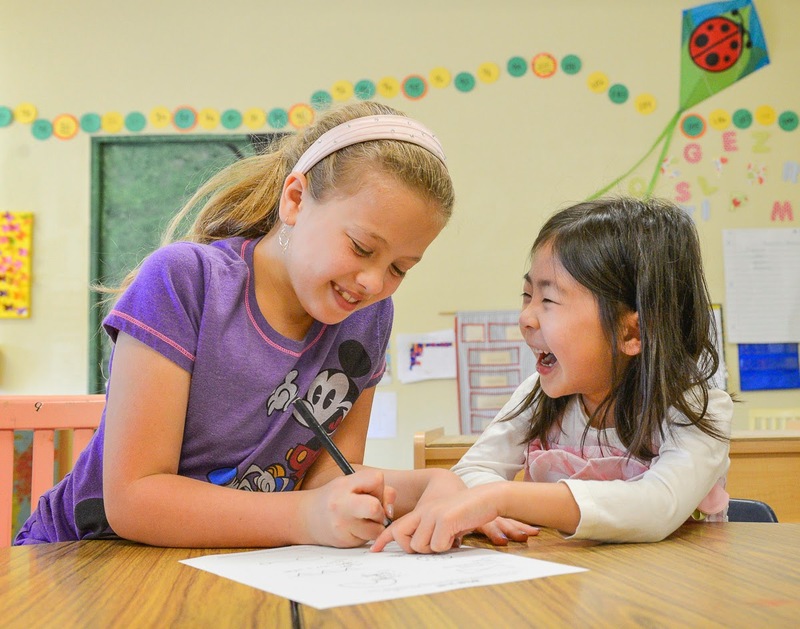 Students at the lower school engage in “Math Adventures,” which are open ended activities that allow students to explore interesting patterns, develop their mathematical thinking, and explore the concept behind the algorithm for solving problems. Students in the fourth-fifth grade class have developed their mathematical thinking through working with Math Pickles and have solved complex puzzles that have stretched their understanding of factors and prime numbers and patterns such as the Fibonacci sequence. 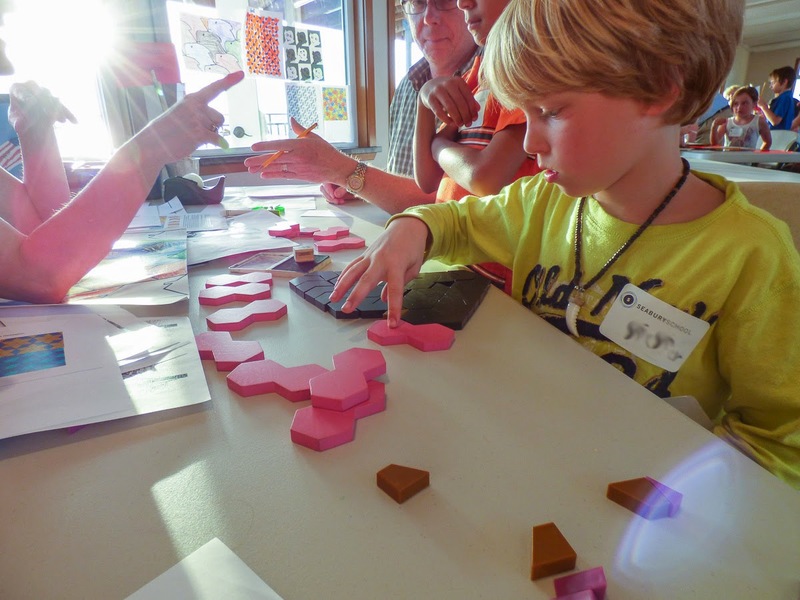 Students at all levels have incorporated math into art, and have made connections in the integrated curriculum to math. Kindergarten students studying marine life recently made a life-sized nurse shark, measuring carefully to make sure it was the size of a real shark. As with all of Seabury’s program, tailoring instruction to meet individual needs, allowing student’s individual development to drive the pace of instruction, and building understanding through engaging, challenging activities drives math instruction. Our students celebrate math because it’s fun, challenging, and it provides a chance to learn something new at school every day. Come celebrate with us! I hope you have had the chance to take a look at our classroom blogs (www.seabury.org) this month as we have highlighted writing at Seabury. While writing is always an important element our program, we have spent this month focusing on the role of writing in our classes. From prekindergarten and kindergarten students authoring their own books (and in the case of our kindergarteners, starting their own publishing company - left photo) to middle school students creating position papers on global issues as representatives at the Model United Nations, developing strong written communication skills is a key element of Seabury's curriculum. 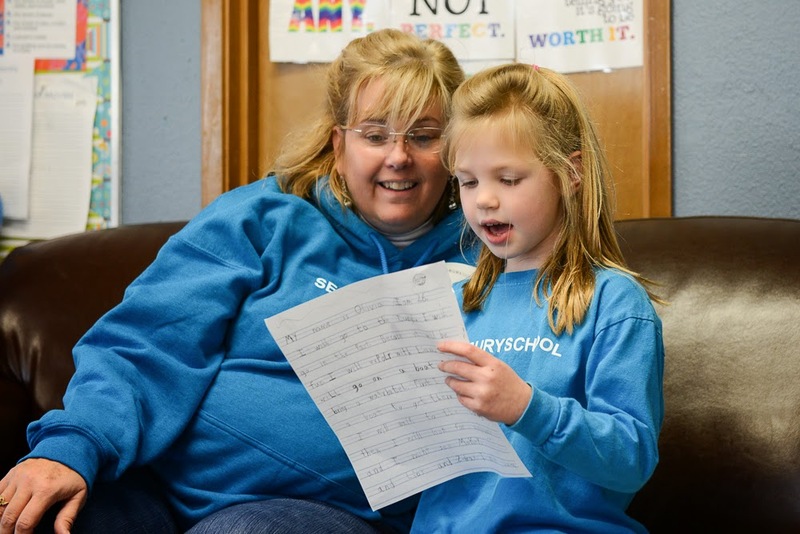 Writing also serves as a perfect example of the myriad ways in which teachers at Seabury differentiate the curriculum, matching instruction and expectations to individual student needs. Writing serves many purposes at Seabury, just as it will in our students' lives. Students learn from the very beginning that writing is a tool for expressing ideas, telling stories, recording information, and keeping track of what they've learned. They learn writing can be personal or shared with a group. When students have opportunities to share their writing in a variety of ways, they learn that taking time to carefully choose their words and construct their stories will mean that the ideas are more likely to make sense to others. They learn that writing can be formal, such as published stories and final papers, or informal, like notes to oneself and journal entries. And, most importantly, by giving students time and opportunities to write about things they are interested in, they learn that writing can be fun. Writing at Seabury is also a great example of the ways in which teachers differentiate instruction to meet students' individual needs. 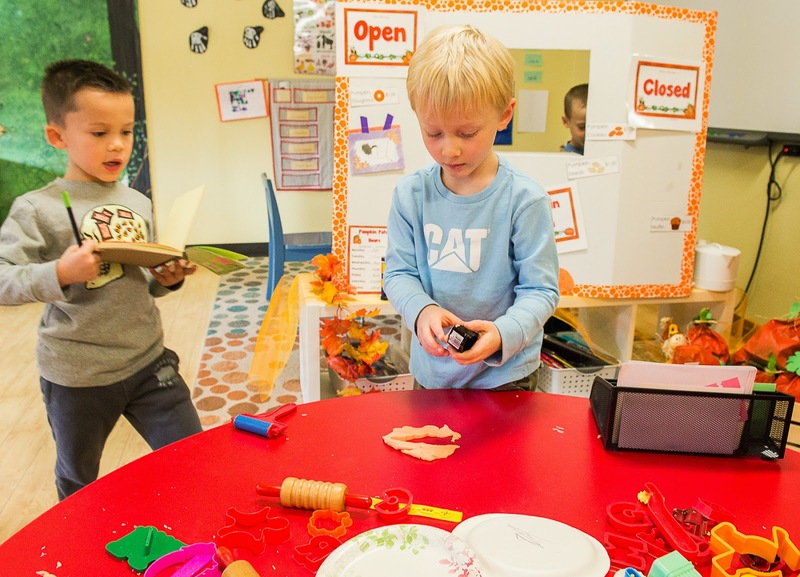 At the prekindergarten level, that means that those who are not yet reading or who are still learning how to form letters might draw pictures of their observations in science, make tally marks to gather information, or dictate their stories to a teacher – writing, but not yet putting words on paper by themselves. As they begin to write words, they are encouraged to use inventive spelling, recognizing that we start by getting our ideas down on paper the best way we can, and then we can go back to correct, clarify and add detail. With young gifted students, we frequently find students who have huge stories in their minds, but whose motor skills make it difficult to get it all down on paper, making the prospect of writing daunting. So writing might become a combination of the student writing and the teacher taking dictation. Teachers work with students one on one or in small groups, allowing them to tailor their expectations to the individual readiness of their students. This is true at all grade levels at Seabury. Teachers might work with the whole group on something they are all ready for, such as how to use more precise, colorful language in their writing, but will then tailor assignments and expectations to the readiness of each student. Working with students individually and in small groups, this could mean that one student might be asked to write sentences using at least one descriptive word in each. For another, it might mean taking a longer piece and working on developing more intricate character descriptions. In elementary grades, students begin to use the computer for some of their writing, making editing and revising something they choose to do rather than are forced to do. By the time students reach middle school, students are writing in all kinds of formats, including blog posts, creative stories for fun, and serious research pieces using the same MLA format they will be using in high school and college. In middle school, just as in all grade levels at Seabury, expectations for students are designed so that they can take the next step on their journeys to becoming strong writers, recognizing all are in different places on those journeys. The result, as you can see in our teachers' blogs, is that Seabury promotes a culture of students as authors. Seabury is a place where kids of all ages beg for more creative writing time. Where kids of all ages use writing as a tool for expressing themselves. Where academic writing, such as research papers and lab write ups is happening in age appropriate ways at all grade levels, including with our youngest children. Our graduates are consistently recognized in high school for their strong writing skills and ability to communicate clearly. This is truly something to celebrate! The process of inquiry, or scientific method as you may have called it when you were in school, is the backbone of science in the real world, as well as in Seabury’s science program. 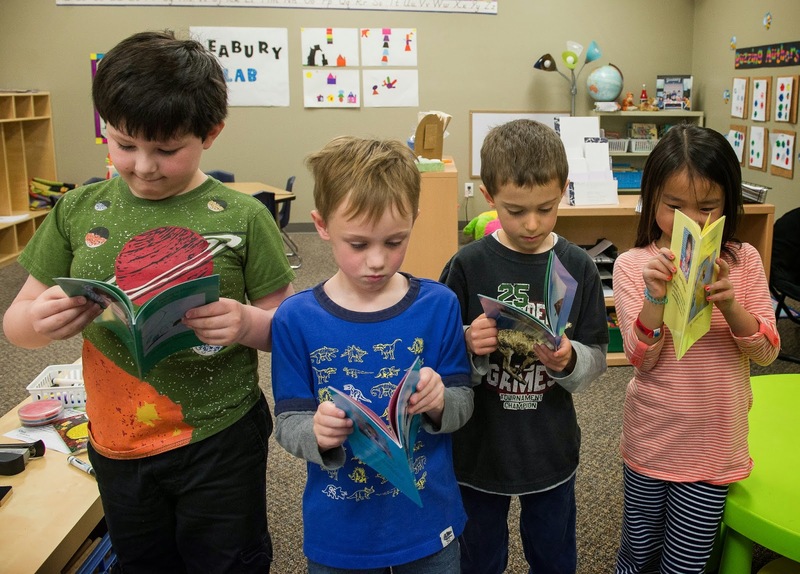 In all classes, from prekindergarten where students have studied everything from plants to planets, to middle school where they have studied chemistry and microbiology, students at Seabury don’t just learn about science. They DO science. They research background information. They learn to ask research questions. They develop hypotheses. They experiment and control variables. They make careful observations and control variables. They draw conclusions and share them with others. The process of inquiry is not limited to science at Seabury. Learning how to ask good questions, gather data and develop conclusions informs the way students approach all kinds of learning. In a world that is changing quickly, we believe that these skills are not only critical for developing students’ skills in the sciences, but are key in all areas. In our rapidly changing world, being able to ask good questions, evaluate information, and form reasoned and well supported conclusions are the skills needed in the 21st century where students today will have jobs that have not even been conceived of yet. You can get a feel for the vital part science plays in real world of our classrooms by checking out our classroom blogs over the past year. (Links at the bottom of www.seabury.org) You'll read about pre-k students exploring surface tension, Newton's third law and what happens as rain moves through clouds. 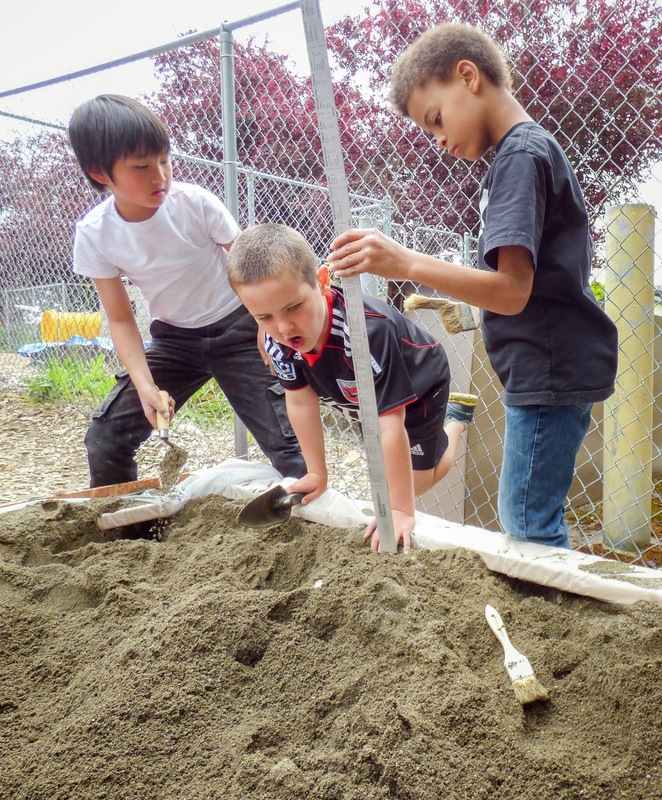 You'll find how our kindergarteners initiated their own study of rocks and spent several weeks weighing, measuring and recording observations about their own specimens. 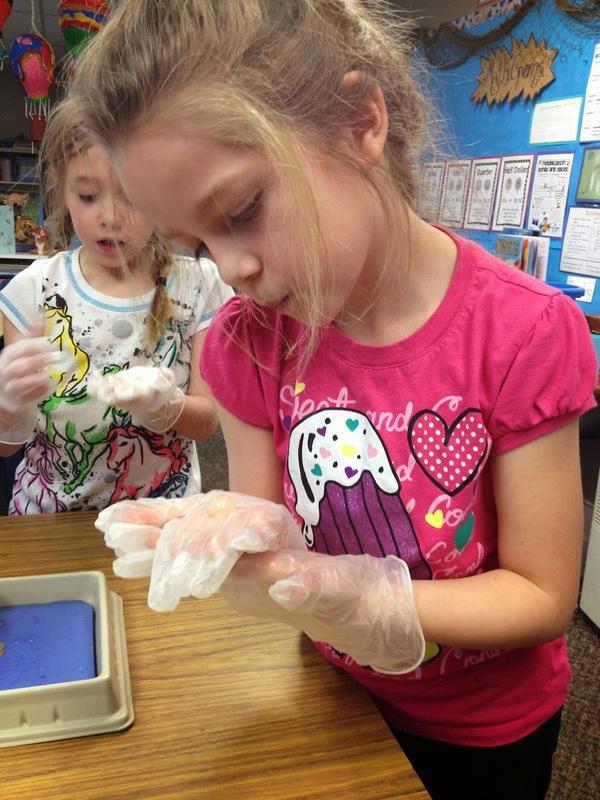 You can read and see pictures documenting the in-depth learning our first and second-graders have done in their study of the human body, including making their own stethoscopes and dissecting a real cow eyeball. You can see the simple machines and incredible Rube Goldberg machine built by our third through fifth graders during their study of physics. Seabury’s recent science fair was a great demonstration of our students’ love of science – and of their love of investigating the world around them. 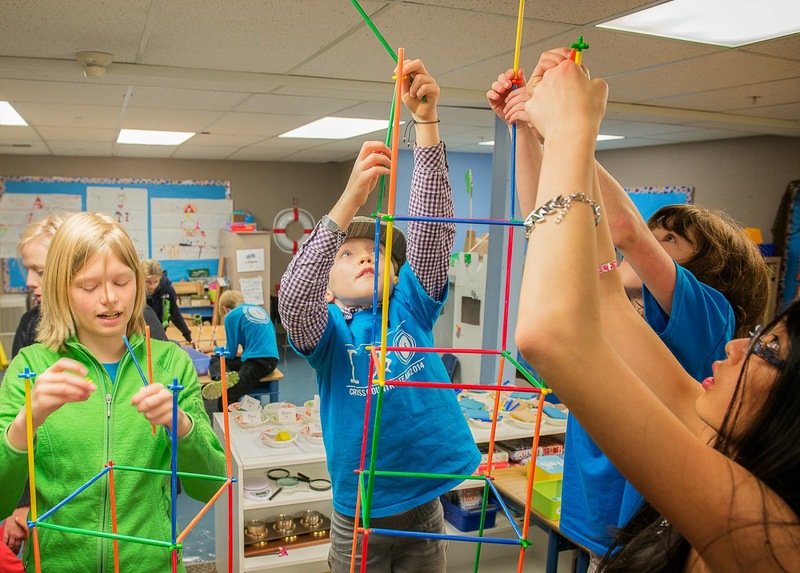 It was a celebration of the power of inquiry, and of giving students space to explore. As we look at Seabury’s graduates and the things they are doing now that they are “beyond Seabury,” we see the spirit of inquiry – of, “I wonder what would happen if…” in so many of the things they are doing. What a joy it is to see where our kids’ questions lead them!